Goloka Dham is a beautiful Radha-Krishna temple in Germany, situated in the idyllic forest of the Hunsrück area. 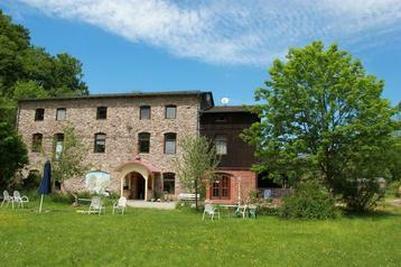 It offers a peaceful place for meditation, worship, spiritual retreats and education. The community was established in 1996 and has approximately 2.5 acres of land. 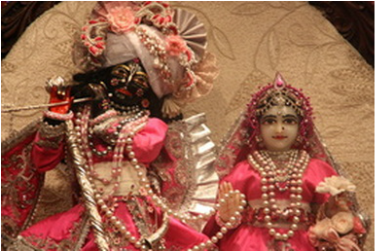 Presently we are a spiritual family of 20 devotees who are aspiring to keep Sri Sri Radha Madana Mohan as the very centre of our life. Furthermore the community consists of another one hundred congregational members who live in the surrounding villages nearby and regularly attend various temple activities and festivals. If you have a navigator you will find Goloka Dhama by entering Hujets Mill, which is the old name of this establishment. - Take the A 6 to Saarbrücken / Kaiserslautern to the junction Landstuhl. - Turn onto the A 62 to Trier and take the exit to Birkenfeld. - Follow the signs to Birkenfeld. - Follow the road through Birkenfeld until the big intersection with traffic lights. - Turn left direction Koblenz. - After about 100m turn left towards Brücken. - In Brücken follow the sign to Abentheuer. - Go through the town of Abentheuer. - After about 2 km you can see on the right a large stone-building. - Enter trough the gate to Goloka Dhama. You can reach Goloka Dhama easily by train. The nearest train station is Neubrücke/Nahe and is situated along the Frankfurt/Mainz route to Saarbrücken. During the day time trains are operating every hour. Please remember that there are several townships called Neubrücke. Your station is Neubrücke/Nahe. For your train connections and ticket booking please visit www.bahn.de.